Reliability and reproducibility are critical in the performance of immunodiagnostic assays and can vary from lab to lab according to factors such as assay reagents used, variation in the level of automation, operator experience, and sample throughput. The quality and stability of assay components are critical to success. 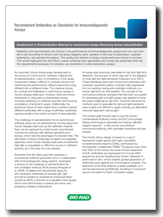 This article highlights how Bio-Rad’s custom antibody team generated fully human IgA antibodies that met the requirements necessary for adoption as standards in routine laboratory assays. An important choice during assay development is the source of control and/or calibrator material and its standardization. Lack of consistency of this assay component makes it difficult to compare results from clinical studies performed by different personnel using different kits at different times. The classical choice for controls and calibrators in autoimmune assays is human disease state sera. However, there are known drawbacks to using sera to standardize assays, including obtaining it in sufficient quantity and ensuring consistency of long-term supply. Additionally, the polyclonal nature of sera means that it contains several different antibodies with a range of affinities, potentially causing variation from batch-to-batch of sera selected. This challenge of standardization for an autoimmune antibody assay can be addressed by moving away from human disease state sera as the calibrator material. Sera can be replaced by a fully human recombinant monoclonal antibody with desired specificity and isotype, which has the advantage of consistent titer. This alternative is being increasingly accepted and adopted, especially when human disease state sera of sufficiently high titer is unavailable or difficult to source in sufficient quantity, as in the case of a rare disease. Scientists from Bio-Rad used their expertise in recombinant antibody generation and, in collaboration with immunodiagnostic assay experts, developed a solution to the challenge of standardization for anti-cardiolipin antibody (ACA) assays (Knappik et al. 2009). A reliable and reproducible assay for anticardiolipin antibodies of isotypes IgG, IgM and IgA is needed to characterize antiphospholipin syndrome (APS), a disorder of coagulation that causes blood clots (thrombosis) in arteries and veins, and pregnancy-related complications. An assay was previously described for IgG and IgM ACA detection, the success of which was due to the adoption of novel IgG and IgM standards (Capuano et al. 2007). These standards were both monoclonal antibodies with cardiolipin specificity (either a chimeric IgG engineered from an existing murine anti-cardiolipin antibody or a human IgM from an APS patient). The concept of the monoclonal antibody standard that had been successful for developing IgG and IgM assays was applied to solve the same challenge for IgA ACA. However, because the methods used to generate the IgG and IgM standards were lengthy and difficult to apply routinely, an alternative improved approach was sought. The chosen path forward was to use the Human Combinatorial Antibody Library (HuCAL®) and phage display technology to generate the missing calibrator reagent required − a fully human recombinant monoclonal antibody, with cardiolipin specificity and IgA isotype. The HuCAL library design is based on a set of framework master genes with highly diversified complementarity regions (CDRs), synthesized by trinucleotide mutagenesis (TRIM). The genes cover more than 95% of the human structural immune repertoire. HuCAL antibodies are expressed from human DNA sequences and are therefore fully human. 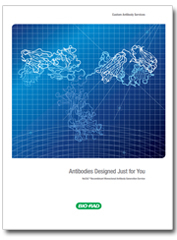 Selection is performed in vitro, which enables guided generation of antibodies even against low immunogenic antigens. The sequence of the final antibody is easily available, so it can be reproduced synthetically, resulting in a long term secure and batch-to-batch consistent supply. The in vitro method of antibody selection and the modular design of the library allow multiple options for antibody formats; for example, mono- and bivalent Fab formats with different epitope tags to aid detection and purification, and fully human immunoglobulin format in the isotype of choice. The antigens used in the panning of the HuCAL library were a cardiolipin mixture and a preparation of plasma-derived purified beta2 glycoprotein 1 coated to paramagnetic beads, and a negative control of beads coated with a solution of 0.5% BSA. Negative control beads were used to deplete antibody-displaying phage that would bind the beads without antigen. Three rounds of panning resulted in an enriched pool of Fab antibody genes, which were inserted into an E. coli expression vector that enables functional expression of bivalent Fab mini-antibodies. A random selection of 368 bacterial lysates, each containing one monoclonal antibody, was analyzed in ELISA and twenty positive and specific clones were identified. After sequencing, ten unique antibodies were produced as mini antibodies in E. coli. Further testing for binding specificity resulted in selection of three Fab antibodies which were subsequently converted into fully human IgA (Figure 1). The recombinant IgA antibodies were characterized to evaluate their suitability as components for IgA anti-cardiolipin standardization. The following was assessed: the binding curve obtained with commercial APS ELISAs, including the LIAISON immunoanalyzer (Figure 2), and the binding curve in comparison with the gold standard based on APS sera (Figure 3); testing alternative protein matrices for the dilution curves; and the stability of the recombinant IgA following freeze-thaw cycles. Most importantly, the binding curves generated using the recombinant IgAs compared favorably with the commercial assays tested, the well-defined serum pools and the gold-standard. The outcome of all of the tests was successful. The performance of the IgAs met the requirements deemed necessary for adoption as standards in the routine laboratory environment. Fig. 2. LIAISON ACA assay with patient samples (left) and with two recombinant IgA antibodies (right). Fig. 3. Comparison of recombinant IgA antibodies with Harris Standard (APL units).